How would you like to go to work or school with salon-styled hair sans the salon cost? The new Remington curling wand is all you need to have beautifully styled hair every single day. With a ceramic wand coated with fine finish from real pearls, the Remington CI9538 Large Pearl Ceramic Professional Curling Wand provides a smooth ceramic surface that your hair could ever experience gliding on. With the popularity of curling wands surging upwards, owners of curling irons are parking them for temporary storage. Curling wands may be similar to curling irons, but it really is so much easier to have relaxed, loose curls, regardless of your hair length or texture. For big bouncy curls or soft and subtle waves, this latest addition to the Remington line of quality hairstyling tools is just what you need. 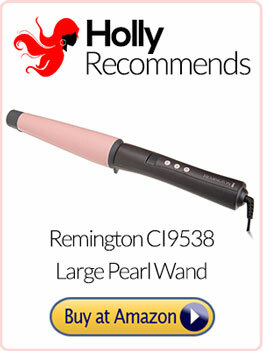 The Remington CI9538 Pearl Ceramic Curling Wand Available at Amazon – Click Here! Curls made by this Remington hair wand form faster and hold longer. Because of Remington’s quick heat up time in less than a minute, your hair gets curled faster. Its smooth surface also prevents damage to your hair strands as they are wound onto the wand. There are no “hot spots” in curling wands when ceramic is used as their material. Ceramic is becoming increasingly popular for its capability to distribute heat evenly as well as maintain the temperature setting selected throughout the length of the wand. The Remington T-Studio Curling Wand has raised the ante for ceramic wands and turned it into the perfect tool for styling your hair in the comfort and privacy of your own home. Consistently on the list of top-rated hairstyling tools used by the best hairstylists of reputable salons, the newest member of the Remington family may look pleasing to the eye but it also packs quite a punch with its numerous features. 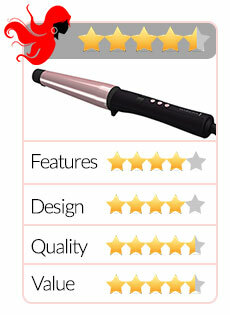 It heats up to the salon standard heat of 410°F in 30 seconds. The temperature lock stays locked after the heat level has been set to ensure even heat. With an automatic shut off mechanism of 60 minutes as a safety precaution. It comes with a heat resistant glove to keep fingers safe while styling hair. The conical-shaped barrel of the Remington Pearl Curling Wand tapers and thins out at its end to curl hair closest to the roots for a natural shape and look. It comes with a warranty of four years. With multifunction buttons: 3 for control, two for temperature adjustment, and one for power. It has a cool tip. Hair has no “burnt” or “fried” smell when using it. May prove to be a challenge when used for very short hair. 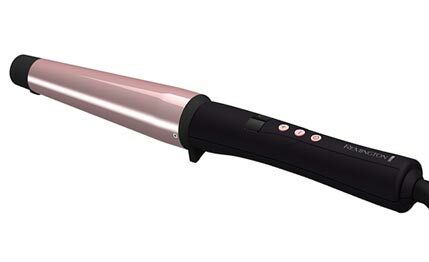 More than half of the 2,067 customer reviews gave this Remington Ceramic Curling Wand an Amazon rating of between 4.5 and 5 stars. Customers found the product easy to use, although some wrote that practicing how to use it was necessary. The customers who found this particular Remington model satisfactory outnumbered those who wrote their dissatisfaction with the product. The cons from these customers included the short cord, the possibility of burning the hands when using it, and unsuitability for very short hair. These cons, however, were debunked by other customers themselves. The con of unsuitability for very short hair as reported by some customers, for instance, was countered with other customers who offered suggestions on how to use the product. Should You Buy the Remington CI9538? Based on the number of satisfied customers saying lots of nice things about this product on Amazon, it’s definitely worth buying. If you have always wanted your hair curly or wavy but don’t have the budget for the expensive hairstyling tools on the market, it wouldn’t hurt for you to purchase this particular Remington model. If you’re the type of person who is “on the go” most of the time but wants to have great looking hair in a matter of 15 to 20 minutes, then yes, you should buy this product. As written in the majority of reviews, customers found this Remington model convenient to use since they didn’t have to apply any styling products on their afterwards. As to reviews that said only experienced users will find this product useful, many customers who were first-time users said it really is just a matter of “learning” how to use the tool to obtain the desired results. If you can learn how to wrap your hair tightly around the wand’s smaller end (for tight, small curls) or around the wand’s full length beginning at its thick end (for looser, larger curls or just waves), then this particular Remington model will be a breeze for you to use. The affordability of the Remington CI9538 Large Pearl Ceramic Professional Curling Wand, however, is what draws customers to purchase it. At such a low price, customers who expected less from it were surprised by its good performance. The four year warranty that comes with it doesn’t hurt, either.